I found this excerpt from “Selected Roberts Papers: Seven Generations of a Southern Lineage” by Charles Stewart Roberts, M.D., and was very excited by it. You can read it here. Researching the Roberts/Blevins/ Wallin connection. I found this article very informing as I was lost in Kentucky and Tennessee. I suspected the connection went further back to Virg. If anyone wants a copy of this book let me know. 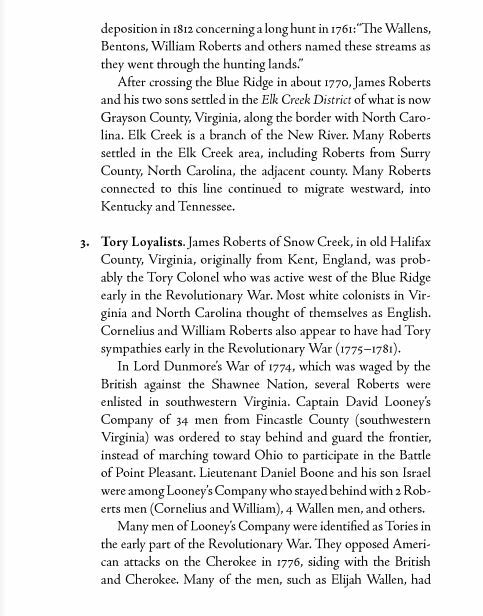 I still don’t quite understand the relationship between John Roberts of Surry County, Tory Colonel James Roberts, William and Cornelius Roberts and Jesse Roberts. Who were the parents of Jesse Roberts? Were William and Cornelius definitely brothers? Who was the father? 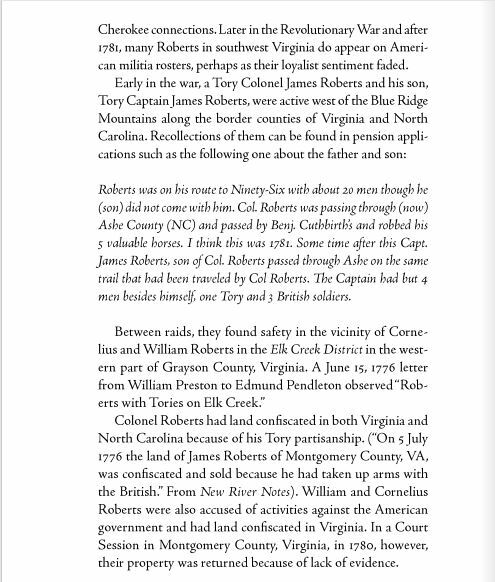 Were John of Surry County and Tory James Roberts brothers? Everyone is closely related, but how? 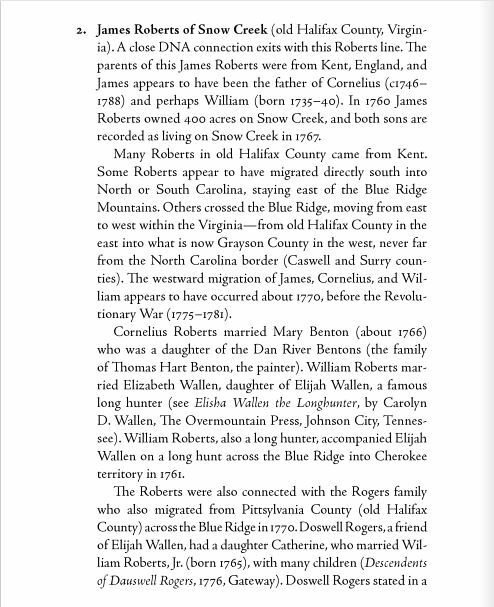 I descend from some of the Longhunters and have some info you might be interested in pertaining to the Roberts clan members of that time period. I am a descendant of Cornelius and possible a John Tuner Roberts who may be the son of Shadrach Roberts and Katherine Turner. Cornelius line married John T. line in Watsonville CA, in the 1800’s. Cornelius is in the Robert’s FTDNA Project and is matching with the William Robert’s of the Robert’s Cove VA family. I have just gotten a John T.Roberts descendant and a Shadrach Roberts descendant to agree to a DNA test that should be completed in Jan according to FT. I would love to have any information you might have regarding these two Roberts.